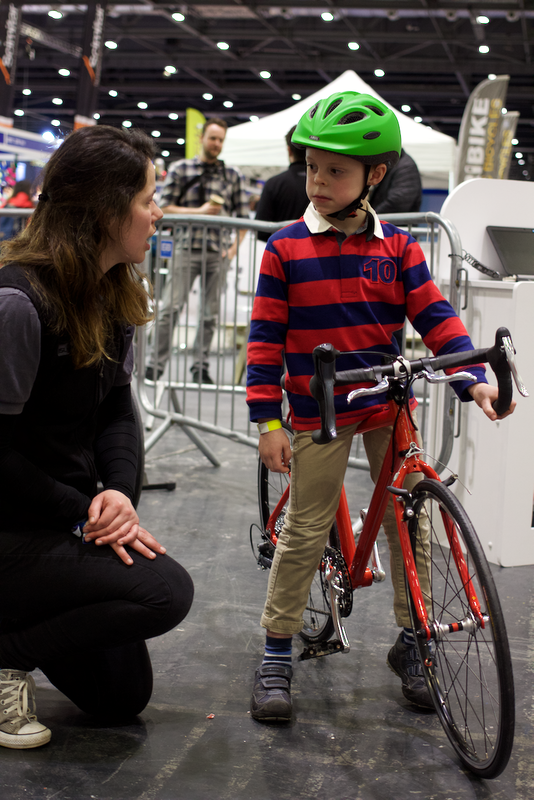 We were delighted to win tickets, courtesy of Islabikes, for this year's London Bike Show at ExCeL, in London's Docklands. Thomas Ivor is between schools at the moment and the only chance we had for all three children to go was the Thursday, which was a shame in that we missed Mark Beaumont, Matt Stephens, Chris Boardman and Chris Hoy, amongst others, but was a blessing in that the show was relatively quiet, it being a school day. One of the main reasons for wanting to go was actually to visit the Islabikes stand, our Northamptonshire home being nearer to the show than their base in Shropshire. 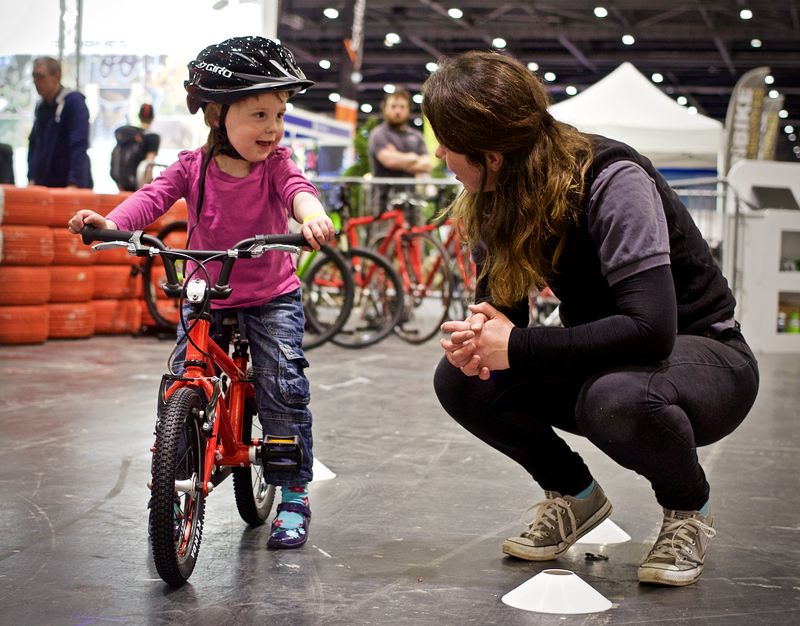 This year we have two possible purchases in our sights - a 24" wheeled bike for Thomas Ivor, and a first set of pedals for Ruth. 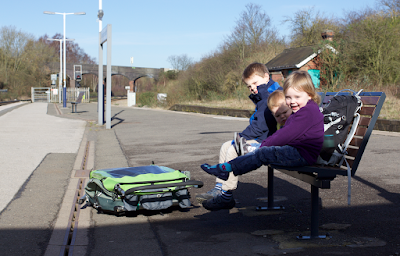 Waiting for the train, Croozer packed flat, ready to go! 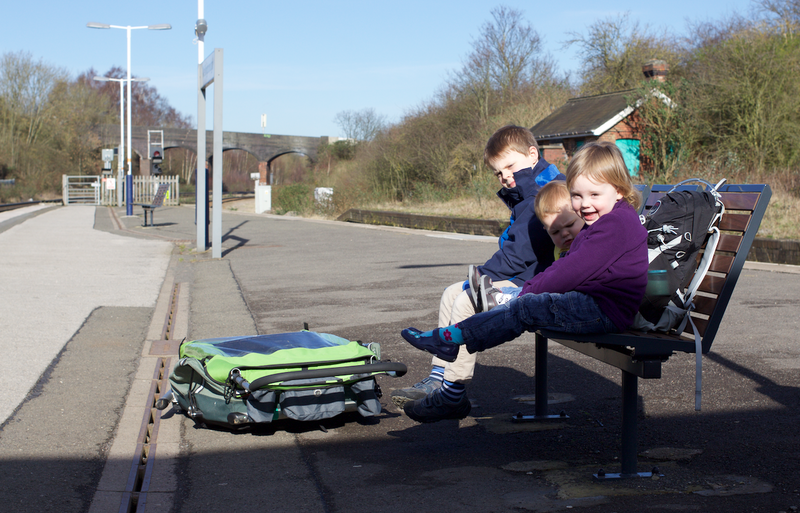 Three children, two of whom are ambulatory but not reliable and still require a considerable amount of paraphernalia, with just the one of me, represents something of a challenge on public transport, and so bearing in mind the success of our trip to the NEC last year, I decided to get brave and take the trailer to London on the train. 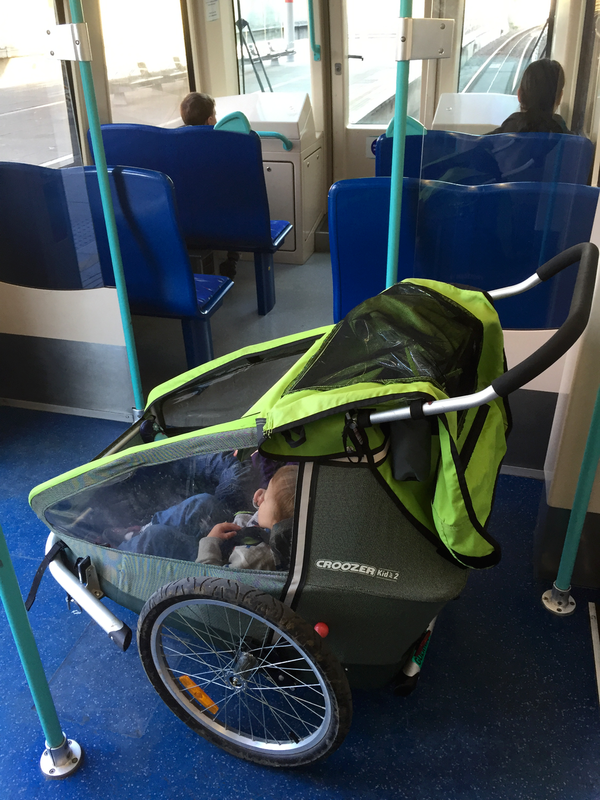 I knew that it was physically possible to get the trailer, I mean, pushchair (nomenclature is important!) 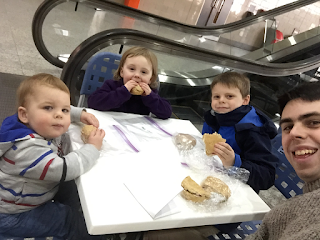 dropped flat, onto the East Midlands Trains 'Meridian' on to St Pancras - it just takes time and practice to get it all ready, and ideally a hand from the platform staff to stop the little ones hurling themselves down the gap, which at Wellingborough, where we boarded, is considerable. Unfortunately, the double Croozer is about five inches too wide to get it in assembled. The best news came when we got to London - and it was a little closer for comfort than I'd have liked, but it all worked! 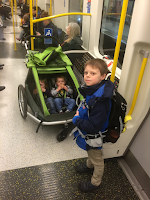 Happily, we can report that we successfully got through the gates at St Pancras, into the lifts and through the ticket gates onto the sub-surface platforms and changed onto the Docklands Light Railway at West Ham and Canning Town. Both the new 'S' stock on the Underground, and the DLR trains, had ample capacity to admit us without causing anyone any bother. 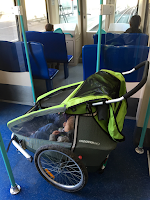 It would seem that the standard door opening of a lift on the Underground is about an inch or so wider than the trailer, so with care, we were able to roll straight in, arriving at ExCeL just in time for lunch. 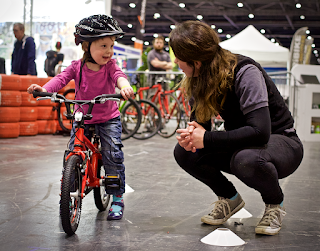 Upon entering the show, mindful that the girls were likely to tire, we headed for the Islabikes stand on the far side of the hall. A lovely young lady by the name of Suzanne greeted us and took time with each of the children individually to give them a go on a bike. 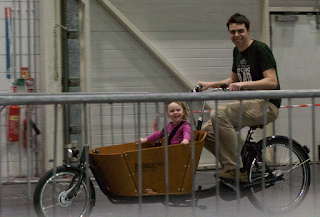 By the time Thomas Ivor and Ruth had had their turn, Rhoda just had to be let out for a spin on a Rothan! The verdict? Well, Ruth is ready for the Cnoc 14 as soon as we are (£250 to find!). 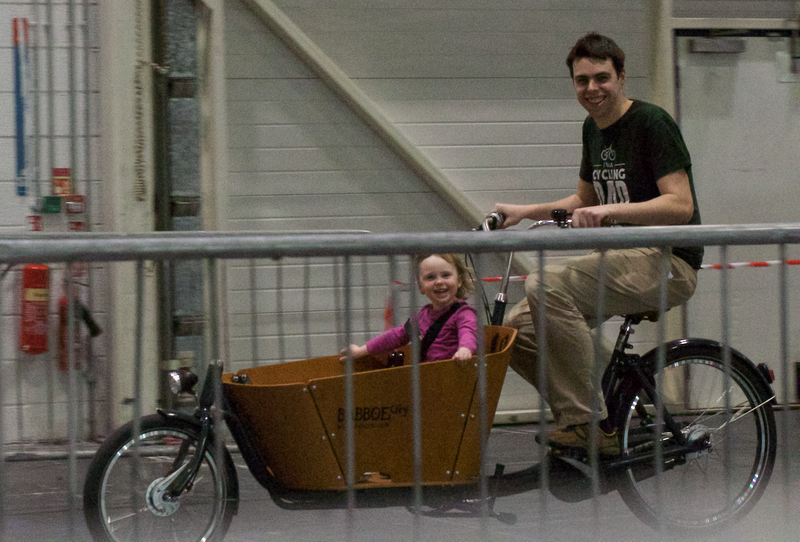 She was almost managing to pedal but it's going to take some work, of course. Thomas Ivor's just had another inch and a half into the seat post on his Beinn 20s, but as yet isn't ready to make the move to the Luath 24, which nevertheless looks like the bike of choice, so that purchase can probably wait until the Autumn. 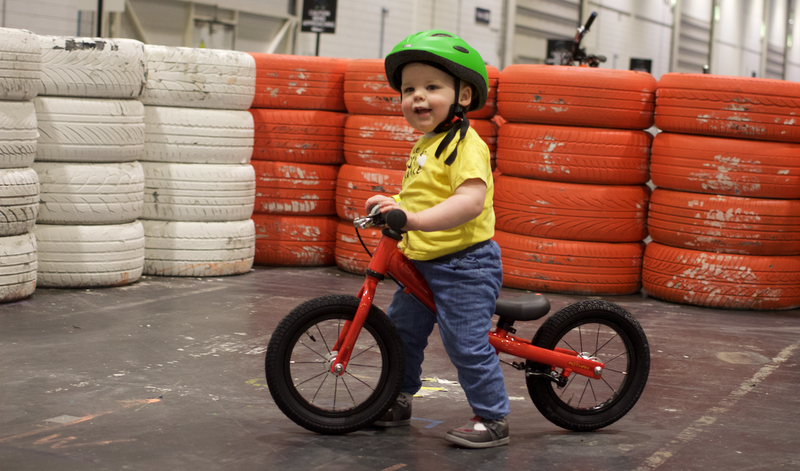 What with looking at bikes, Thomas Ivor riding a motorcycle, visiting various tourist boards' stands, watching people do ridiculous things on the climbing wall, street velodrome and BMX ramps, we had an action-packed afternoon. We traded Alan Partridge quotes with the man representing the Norfolk Broads, had some good-natured banter with some people trying to make cycling acceptable in the New Forest, and a bizarre encounter with a jobsworth who accused me of trying to kill Ruth by test driving a Babboe City cargo bike (which I loved, by the way) on the short test track - without a helmet! Horrors! The poor Dutch chap who demonstrated it to me must have wondered what all the fuss was about. We want to say a warm 'thank you' to the folk at Islabikes for their superb customer service, which as always lives up to the product's high standards, for the competition prize of the show tickets and for replacing Thomas Ivor's leg warmers, torn when he came off in the park the other week, which was a very kind gesture indeed.